Like a fine necklace which enhances the wearer, Broad Street beautifies the city of Newark. It has been a most important highway throughout this city's 330-year history. In the original street survey, two English-style commons or greens were laid out and today are Military and Washington parks. Lincoln Park on south Broad Street in the 18th century was still farmland, and was to remain so until the 1830's. In its first two centuries, Broad Street was literally the most important part of Newark. Washington Park, first known as 'The Market Place,' was for a brief time the center of a small industrial development, and during the Revolutionary War was the site of the first Newark Academy. A large boulder marks its old location today. At the intersection of Broad and Market streets was Robert Treat's home, the site of Arch Gifford's colonial tavern, and the town water pump. Near Broad and Branford, the present site of Old First Church, known as the 'new church,' is actually the third home of the congregation which opened January 1, 1791. At the northern point of Military Park, Trinity Church, now Trinity-St. Philip's Cathedral is celebrating its 250th anniversary. At the intersection of Broad and William streets, stood Aaron Burr's parsonage where his son, the future vice president was born. It also was where the College of New Jersey was founded. 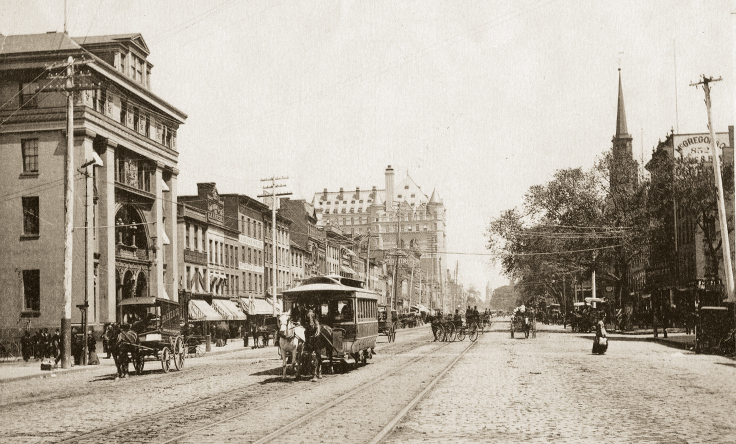 On the eve of the Revolutionary War, Broad Street was a handsome row of red brick Georgian-styled buildings, complemented by two colonial church spires and surrounded by lush green elm trees. Few changes occurred until well after the War of 1812. Indeed, following the American Revolution the times were difficult for the little village. It was not until the 1830's that Newark again began to prosper. In Washington Park a first generation of city mansions were under construction while older houses along south Broad Street were giving way to commercial encroachment. As the Civil War approached, commerce began to move north with the emergence of L.S. Plaut's Bee Hive and farther north Hayne’s Department Store. South of the 'Four Corners,' a new row of clothiers began to emerge with names such as Nehemiah Perry, Ballantine and Colyer, George Watson, Marshall and Ball, and William Stoutenburgh. By the start of the 20th century, Broad Street was beginning to reflect a beaux arts-style building-pattern then popular in America and Europe. The 16-story Firemen's Building, New Jersey's first skyscraper, replaced an earlier French Empire-styled building which was located on the site of Arch Gifford's tavern and by the mid 1920's, the 36-story National Newark and Essex building and the adjoining art deco-style Lefcourt Building had become the state's tallest office structures. Policemen at the traffic tower at Broad and Market attempted to supervise the flow of cars and trucks, but the added trolley congestion made the intersection one of the nation's busiest. To divert some of the confusion from the intersection, the old Public Service Terminal building was constructed a few blocks to the northeast. In the 1950's Mutual Benefit and the Prudential anchored the downtown in the 'New Newark Movement' by constructing their new headquarters several blocks to the northeast. This helped to stem the exodus which was occurring in Newark and elsewhere. As we approach the end of the present century, some of the glitter of the dowager's necklace has definitely faded; still Broad Street remains the city's most venerable street. Important reminders of earlier times continue as evidenced by Trinity and 'Old First,' the Washington/Lincoln plane tree that grows along western edge of Military Park, the nationally recognized Newark Public Library and the Newark Museum. The New Jersey Performing Arts Center, now under construction, soon will rival both the Kennedy and Lincoln centers, and the New Jersey Historical Society soon will move within steps of downtown cultural complex. To the west of Broad Street, the university community already is challenging its counterparts in New Brunswick and Princeton, while silent sculpted sentinels along Broad Street of George Washington, Christopher Columbus, Seth Boyden, and John F. Kennedy, as well as the Wars of America, watch over the ever-changing daily drama as Broad Street and Newark continue to unfold.